On December 10, 2010, at 19:00 in the Kim? 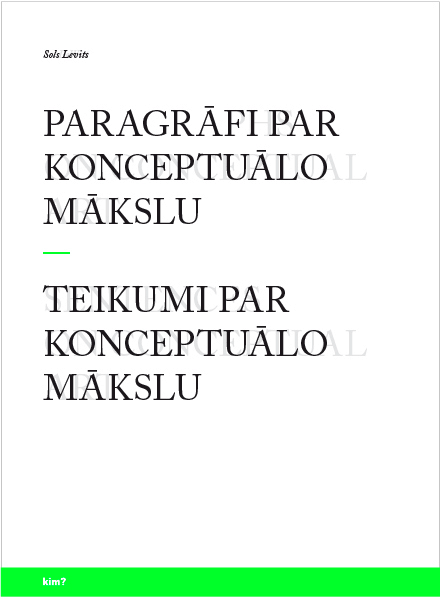 library, an opening of the Latvian translation of the key texts by Sol LeWitt took place, as ”Paragraphs on Conceptual Art” (1967), and „Sentences on Conceptual Art” (1969) have been translated into Latvian by Jānis Taurens, professor and reviewer of contemporary arts. „Paragraphs on Conceptual Art” by Sol LeWitt is regarded to be one of the most important texts of conceptualism; it’s because of this text the term got widely known and accepted. In his interview to Paul Cummings, LeWitt explains: „In fact, the only reason that I did any writing is that (I wrote about what I called Conceptual Art), is really the fact that the critics had not understood things very well. They were writing about Minimal Art, but no one defined it. Still to this day no one has written anything. People refer to me as a minimal artist, but no one has ever defined what it means or put any limits to where it begins or ends, what is and what isn’t. It’s just a convenient label. It still has no meaning. Now they write about post-minimalism; they’re putting another stratum on a thing that has no foundation. No one has bothered to define what post-minimalism is either” (Meyer, James. Op.cit., p.3). During the opening of the translation in the Kim? library, the widely known paragraphs and sentences by Sol LeWitt were presented by the translator Jānis Taurens; copies of the translation itself will be available for all the readers and visitors for a rather nominal price. In the meantime, in the Kim? lecture room a performance by Arturas Bumšteinas, Lithuanian artist and composer, took place. Inspiring from the American artist John Baldessari (1931) and his version of the „Sentences..” from 1972 when LeWitt’s text was sung, using some popular melodies of that time, Bumšteinas has created his own version of “reading” these texts. Sol LeWitt (1928-2007) – an American artist and a theoretician; his name mostly connected with the conceptualism and minimalism in art. Jānis Taurens (1961) – studied architecture in The Riga Polytechnic Institute, and philosophy in the University of Latvia; PhD in Philosophy since 2005, associated professor in the Latvian Academy of Art since 2006; regular contributor to the main cultural magazines in Latvia; thinks and writes on philosophy, architecture and contemporary art.